Visits to the National Museum trigger common memories. As a museum professional, I get to experience many cultural exchanges between our visitors which makes my own experience very enriching. The TCI National Museum exhibits give them a “sense of place” which Fritz (1981) defines as the specific experience of a person as a result of being in a particular setting. This experience triggers memories that lead to the amazing exchanges that highlight commonalities that exist when on the surface there seem to be apparent differences. As a result, museums foster greater understanding and appreciation for the cultural heritage of humanity. 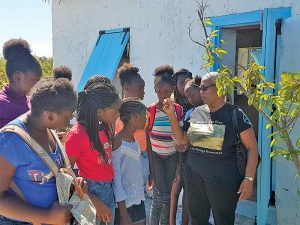 The Caicos Sloop boat-building project connects children with a traditional craft. Our Caicos Heritage Homestead Exhibit offers such a “sense of place” experience. One of my visitors from Newfoundland said that bath time for children as depicted in the exhibit reminds her of her own experience as a little girl at her grandmother’s house. Visitors from Ohio said this could have been the house where they grew up—it was only missing the fireplace. They were also moved to share memories, including uses for ashes much in keeping with traditional practice in these Islands. Some tours evoke a different response. Our guides, the elders of the community, share a deep concern that “Our children do not know how we lived.” This drives the movement to ensure that the TCI’s cultural heritage is passed on to the next generation. The Museum is where these needs of the community can be expressed within the global context of sustainable development goals. Emily Malcolm shares traditional knowledge of local plants. This year the Museum plans to expand the yard field to include more plants so that students and visitors can learn about the types and uses of traditional plants typically found there. The Museum will be collaborating with Nutrition in Demand, a local NGO spearheaded by Tamika Handfield, to create a community garden as an extension of the exhibit. Nutrition in Demand aims to encourage persons to increase their intake of fresh fruits and vegetables by teaching them how to grow their own food and offering a space to do so. Gardening was once an integral part of the sustainable way of life on these islands. The Caicos Sloop is very much a part of the cultural heritage of the Turks & Caicos Islands. Pastor Goldston Williams, one of the few remaining traditional boatbuilders, has almost completed the Caicos Sloop started during the inaugural International Museum Day event “Back in the Day” in May 2017. This boat will become part of the Caicos Heritage Exhibit and a testament to the skill and mastercraftsmanship of this tradition that has been passed down through the generations of TCI boatbuilders. Pastor Williams often says that he is making a boat that will be at the Museum long after he is gone so that future generations will come to know that old way of life. He remembers fondly that his father went out to sea daily to fish. It was the importance of the boat to his family that inspired him to become a boatbuilder. Although that way of life is no longer prevalent on the Islands, we aim to revive boatbuilding so that the traditional craft is not lost. That skill could be used to build boats for tourism purposes and/or competitive events. 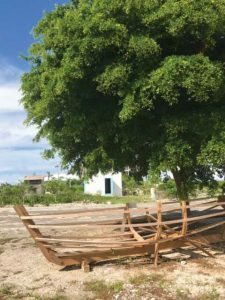 The museum will collaborate with the Caicos Sloop One Design Project that will facilitate transfer of the traditional knowledge of boatbuilding. On May 18, 2019, International Museum Day will be celebrated at the Museum in Grace Bay, Providenciales with the theme, “Museums as Cultural Hubs: The future of tradition.” Visitors will experience aspects of the various traditions that supported the sustainable lifestyle typical of most of the last century—a lifestyle where reduce, reuse and recycle was practiced. A combination of arts, crafts, music, games and food will create a “back in the day” and “sense of place” that will lead to cultural exchanges. We welcome all to this opportunity to reminisce, reconnect and relax with family, friends and guests as you become a part of this living heritage cultural hub.